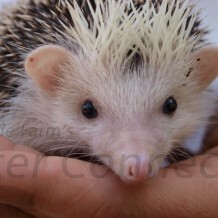 Hedgehogs are born blind and have small bead like eyes. Hedgehogs have a poor sense of sight. This is probably due in part to their burrowing nature. Compared to humans, and even dogs and cats, hedgehogs have limited binocular vision. They have a hard time with depth perception and will often fall from dangerous heights, because they simply cannot tell how far they are from the ground. Other hedgehog senses are much stronger and overcompensate for this weakness. Since hedgehogs have limited eyesight, they don’t always see you approaching them. We encourage you to pet your hedgehog from front to back – from tip of nose to up and over the head and back. By allowing your hedgehog to see your hand and smell your hand, it will see that it’s you approaching them and relax into your caress, rather than tense up from the unknown approach.